Tickets are now on sale for one of Seattle’s most unique (and popular) beer festivals. Tickets will sell out well in advance, so if you plan on going to Hops and Props on February 25, 2012, then you best jump on these sooner rather than later. Details are below, and you can check out this review from the 2011 event if you are not familiar with it. 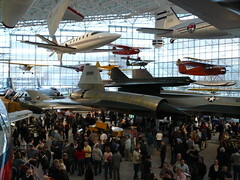 SEATTLE, Nov. 11, 2011—Tickets for The Museum of Flight’s annual craft beer tasting event, Hops and Props, will be on sale to the general public beginning Monday, Nov. 14 at 9 a.m. The 2012 Hops and Props will be on Saturday, Feb. 25 from 7 to 10 p.m., with a VIP event from 6 to 7 p.m. With over 40 brewers on hand, Hops & Props is one of the premier events of its kind in the Northwest. Tickets typically sell out early. All proceeds benefit The Museum of Flight. Tickets will be available on-line or at The Museum of Flight Store. General Admission is $75, VIP $100, Museum of Flight Members $60, and Designated Drivers $35 (Designated Driver tickets will be available in the Museum Store the night of the event.) Maximum purchase of 10 tickets per membership. All ticket sales are final. No refunds. No one under 21 admitted. I.D. required. The general admission ticket includes access to Museum galleries, a commemorative glass, a tasting guide, buffet from Catering by McCormick and Schmick’s and beer tasting. The designated driver ticket includes access to Museum galleries, commemorative glass and buffet from Catering by McCormick and Schmick’s. The VIP ticket includes all of the Hops and Props priviledges plus an exclusive session with a craft brewer, admission is limited. The independent, non-profit Museum of Flight is one of the largest air and space museums in the world, attracting more than 400,000 visitors annually. The Museum’s collection includes more than 150 historically significant air- and spacecraft, as well as the Red Barn®—the original manufacturing facility of The Boeing Co.The Museum’s aviation and space library and archives are the largest on the West Coast. More than 100,000 individuals are served annually by the Museum’s on-site and outreach educational programs. The Museum of Flight is accredited by the American Association of Museums, and is an Affiliate of the Smithsonian Institution. Too bad the tickets have to be purchased through Ticketmaster. They want address, phone and email address and as part of the process you have to consent to TM selling your information to their affiates – in other words, I have to consent to receiving a bunch of unsolicited advertising just to buy some tickets. Not happening. Oh well. Plenty of beer events in this town. Tickets are also available at the Museum.